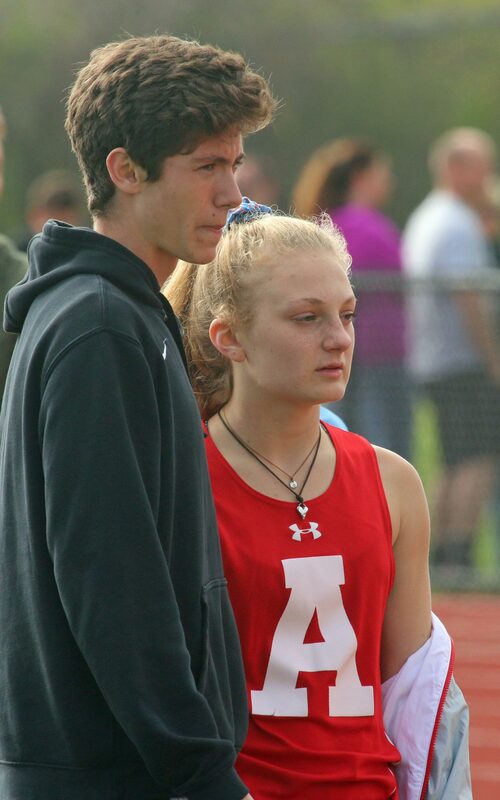 (Newburyport MA) Good day for the boys/girls track teams of Amesbury. 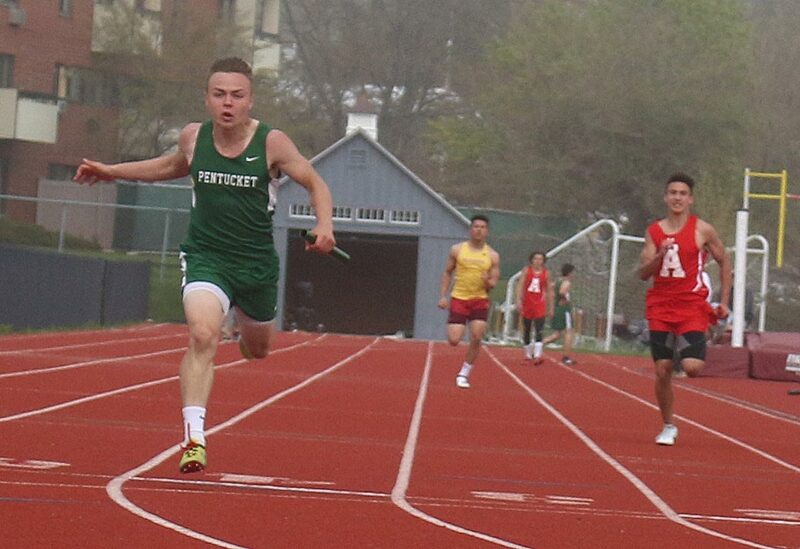 The undefeated Indians came away with victories over Pentucket and Newburyport on a comfortable, then chilly, Wednesday afternoon of Cape Ann League outdoor track at Fuller Field. 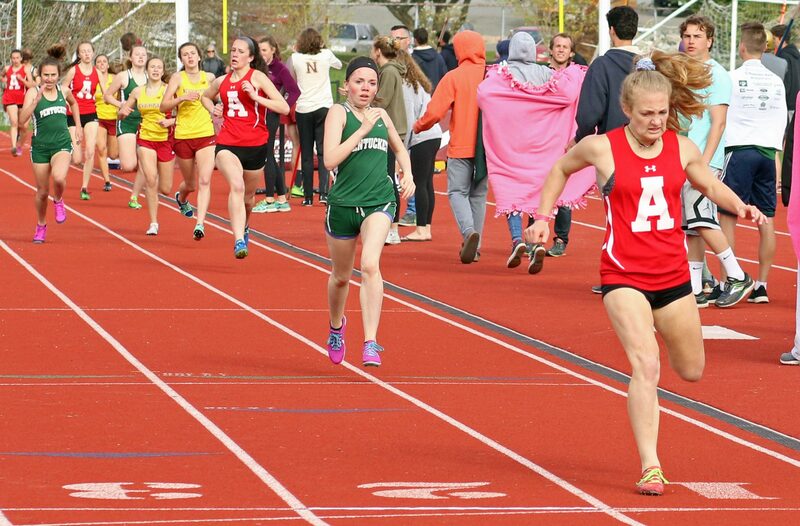 Division 2 Pentucket and Division 3 Amesbury have two of the best track teams in the area. Both were 7-1 last year. 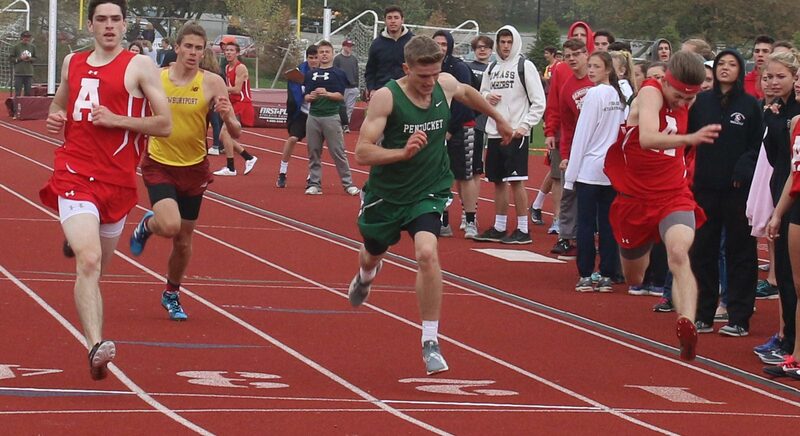 Be certain that when the CAL season ends, the Sachems and Indians will figure significantly in the post-season races. Please permit a paragraph of whine: With no numbers, it is a challenge to sort out names. With no posted stats, it is a challenge to produce accurate results. Kind of like area outdoor track. Who needs a program when everyone knows each other! 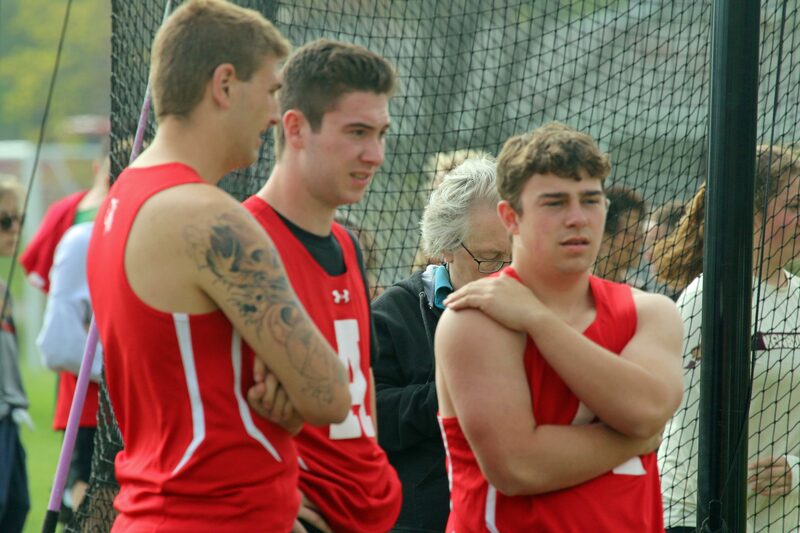 That’s one of the things I like about outdoor track; relaxed atmosphere. 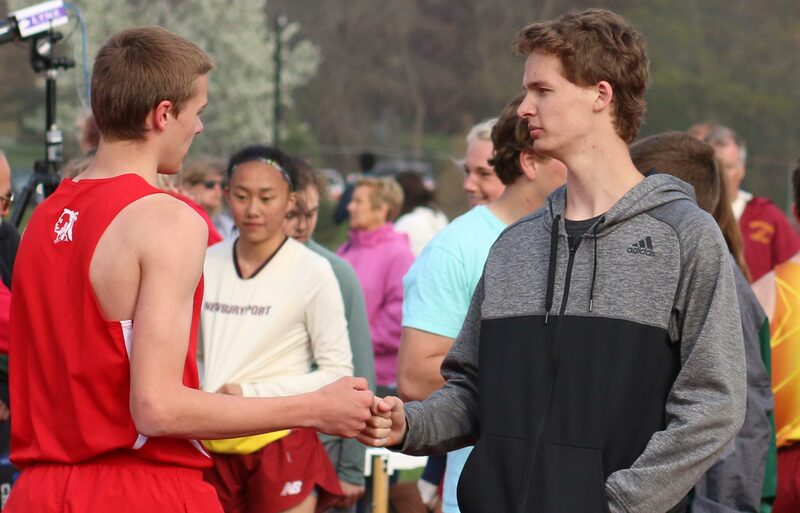 There’s plenty of socializing and plenty of encouraging going on. 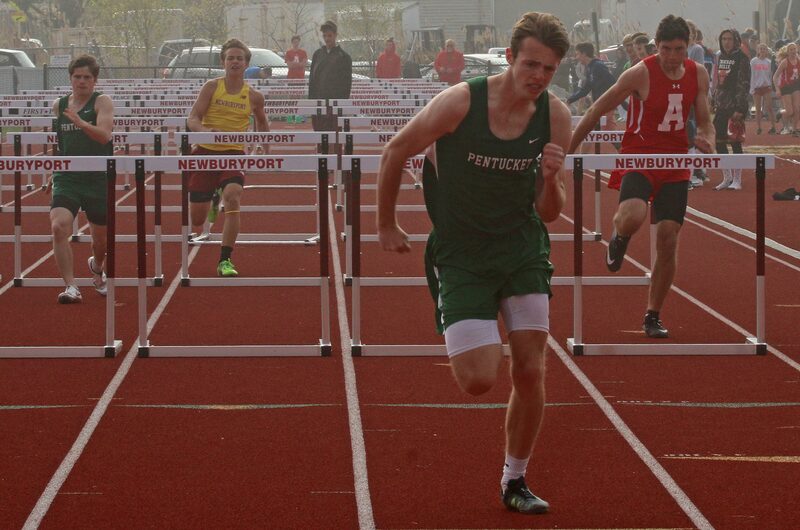 I thought that host Newburyport was wonderfully organized. Things ran smoothly and quickly. Fuller Field seems to be perfectly set up for outdoor track. Are bleachers a necessity? Not on this afternoon. Prime reason for covering today’s meet? 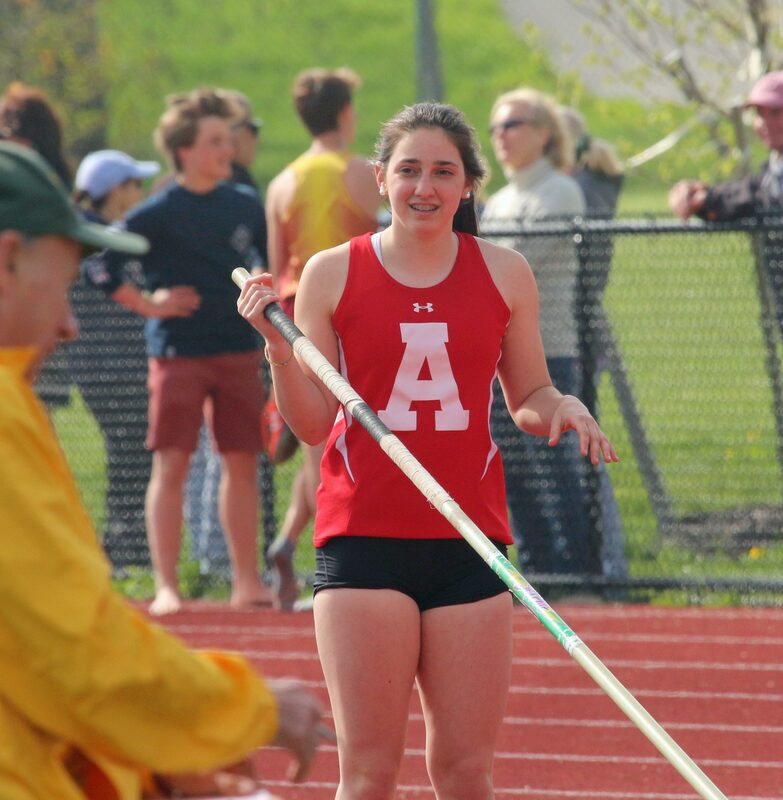 Take a look at UNH commit Saige Tudisco. 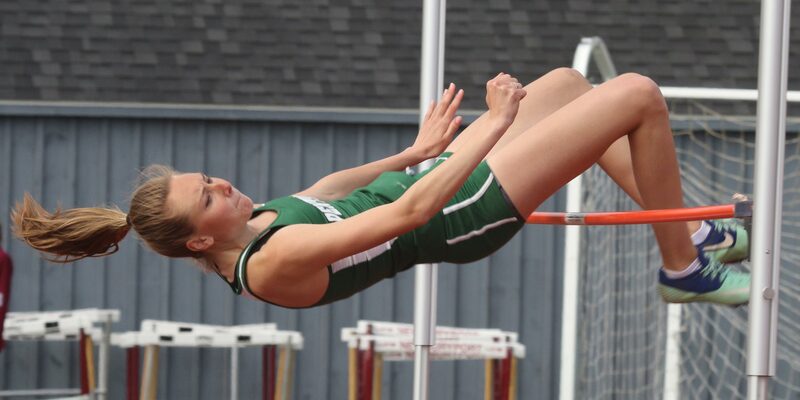 The Pentucket senior delivered. 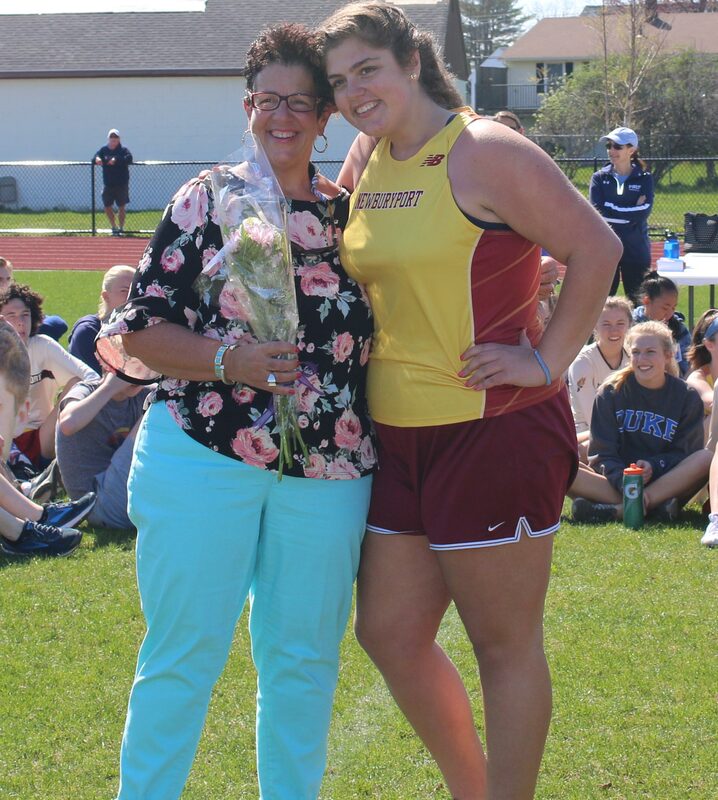 Won all four events (long jump, high jump, 100 hurdles, 200) and she was in with a next-level approach to each event. 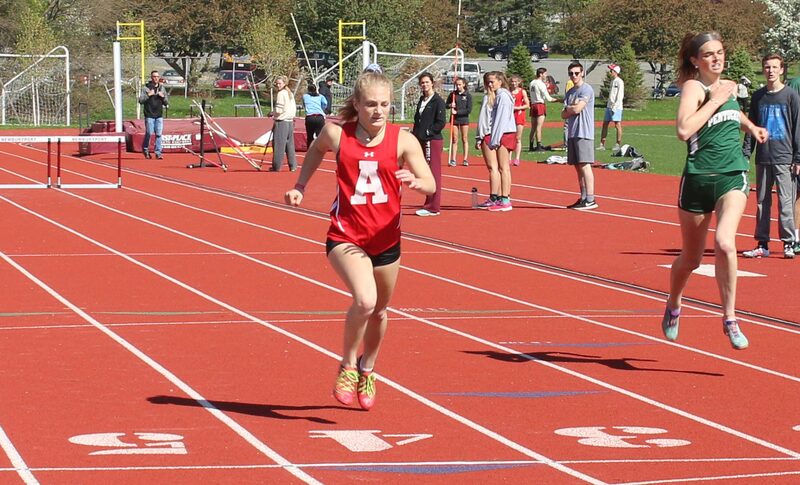 The highlight for Saige may have been beating the very fast Caroline Schissel (Amesbury) in the 200. 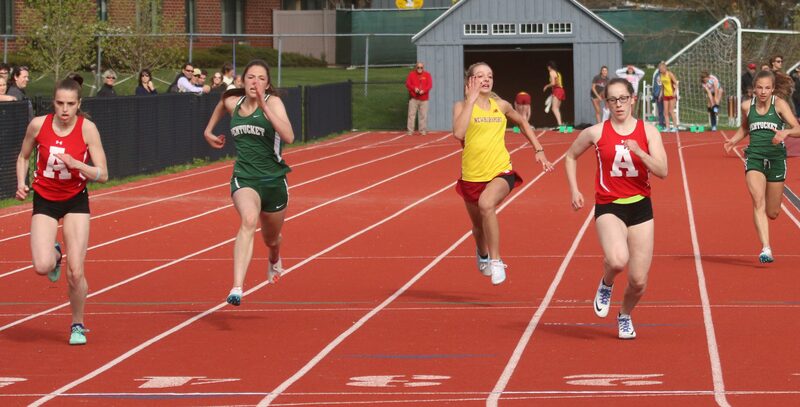 Caroline Schissel (left) nips teammate Schuyler Snay in the 100. 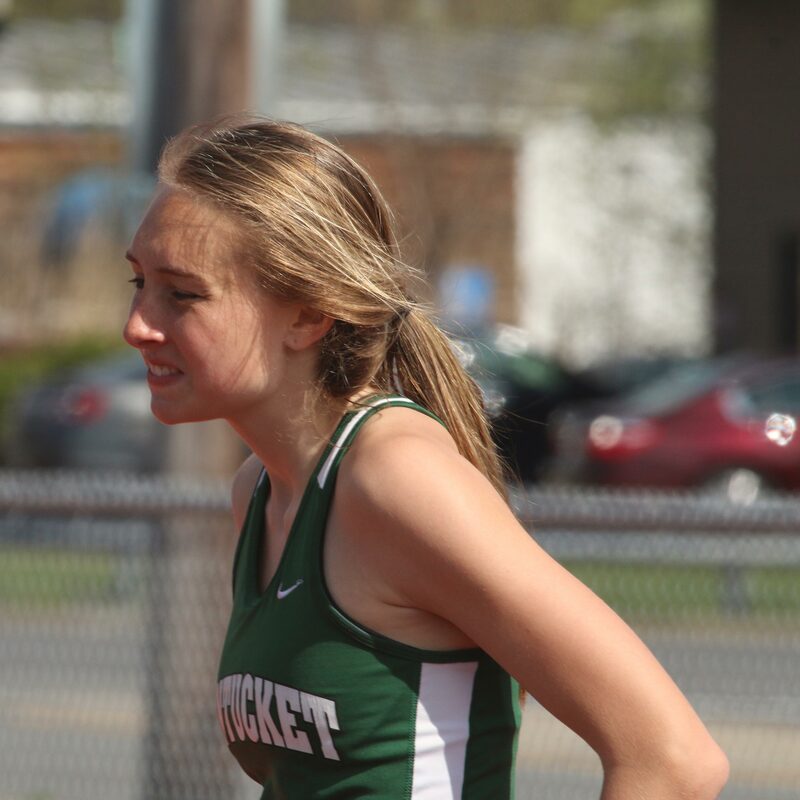 Kaley Enright is 3rd. 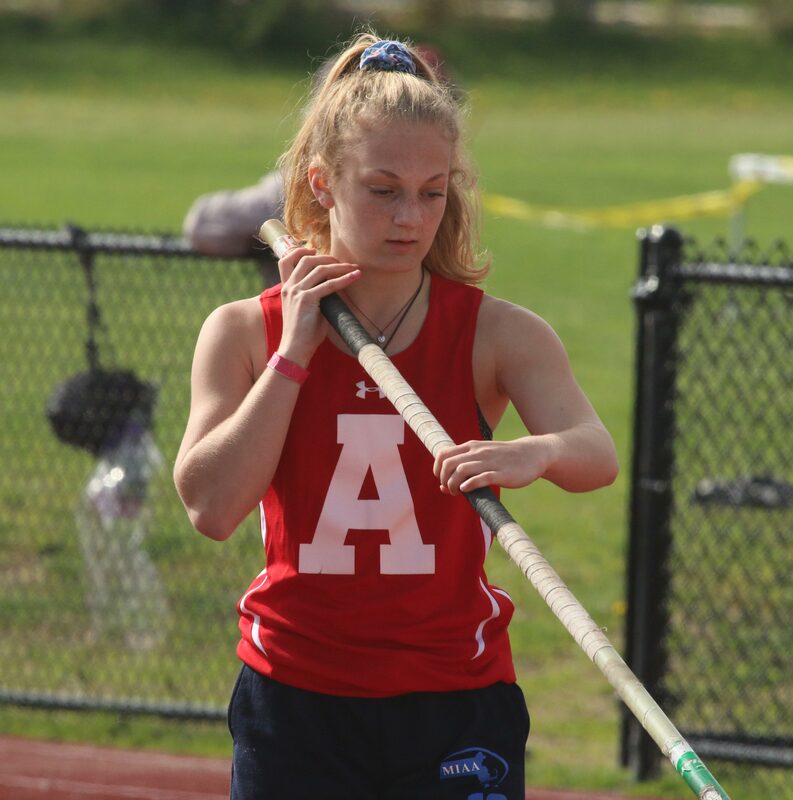 Earlier, Caroline had a win over teammate Schuyler Snay in the 100 setting an Amesbury school record (12.19) in the process. 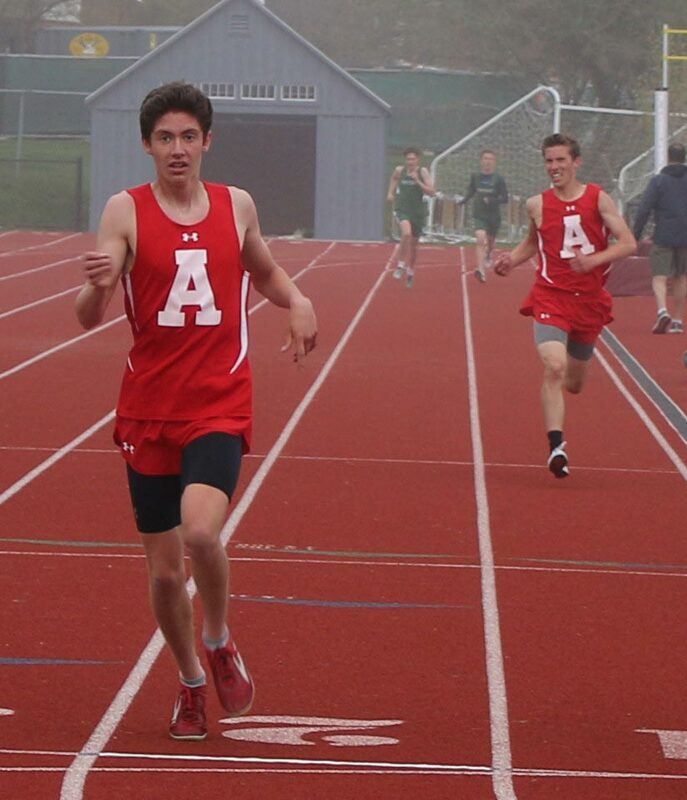 The Amesbury girls defeated Pentucket 79-66 while the AHS boys won 78-67. 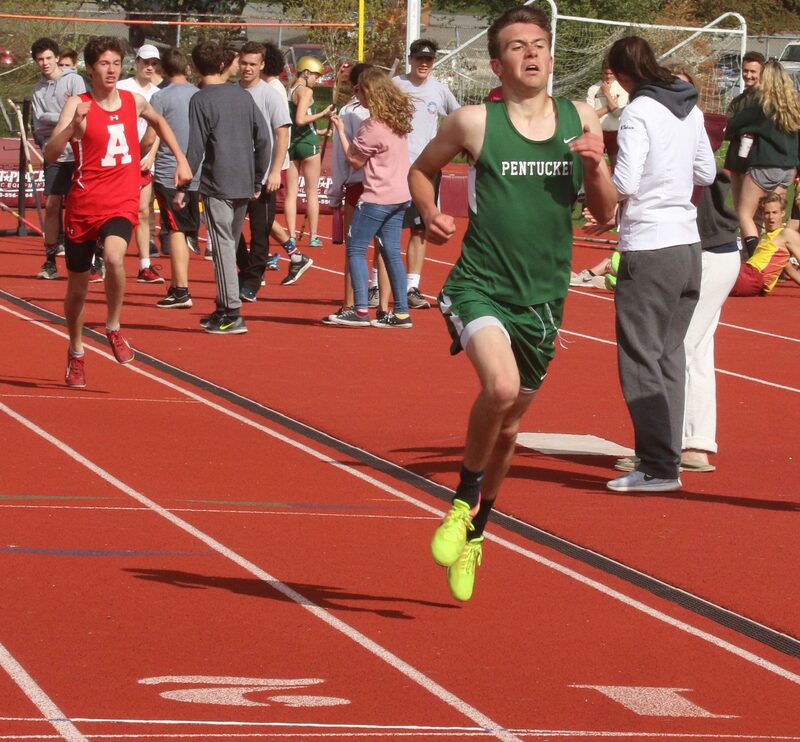 The third school in the tri-meet (Newburyport) had wins from Sam Acquaviva (800) and Donte Harmon (100 meters). 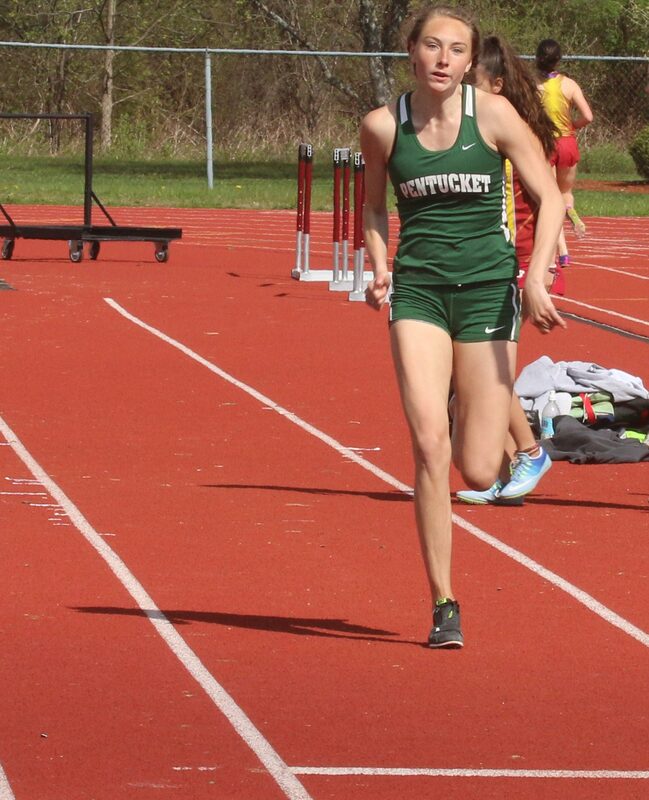 Pentucket’s promising freshman (Syeira Campell) cruised in the 400 (59-84). 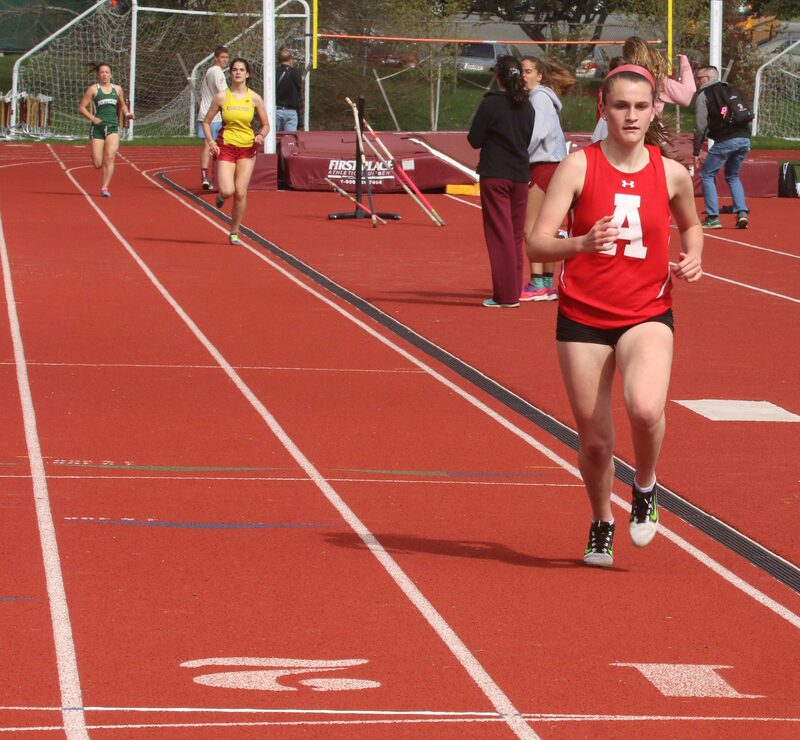 Amesbury’s Chelsea Lynch (400 hurdles, pole vault, 800) and Michaela Halloran (mile, two mile, 4 x 100 relay) finished first in three events. The weather today highlighted the best of spring (sunny 60s) early on and later lowlighted the worst of spring (cloudy, windy, fog, 40s). How do you dress for such conditions?